Most people start the new year with a resolution to eat healthy. 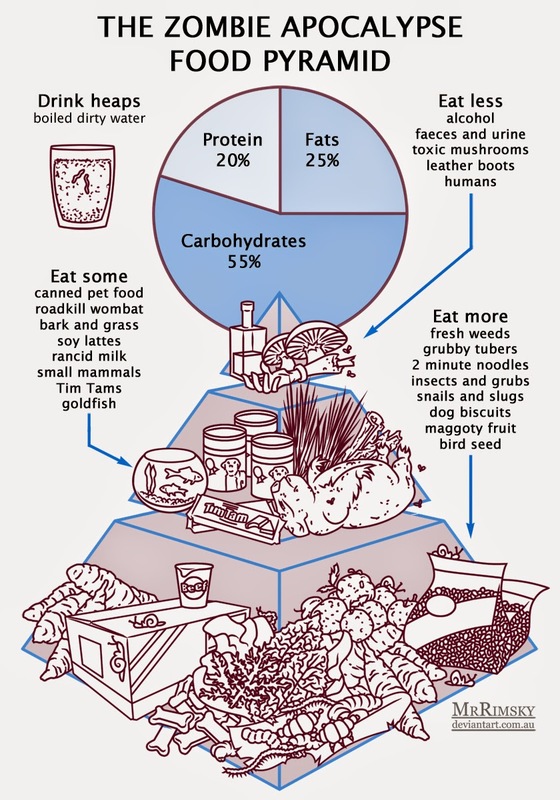 So lets look at some basic nutrition, zombie apocalypse style. You are probably familiar with the classic food pyramid. It outlines the amounts of the main food groups you should eat. The pyramid is a very important nutritional tool that everyone ignores, especially teenagers. When the zombie apocalypse comes we will be forced to eat whatever we can. Yet, when in a disaster situation you want to ensure your best health, so you can fight off disease and any of your hungry companions who might want to eat you. Nutritionists argue over the exact ratio of carbohydrates to protein to fat that a person should consume. As a rough guide about half your diet should be carbohydrates with a quarter for protein and a quarter for fat. A little less fat than protein is better. Still in a zombie apocalypse you can't afford to be picky and you will probably eat anything you can get your hands on. Plus you won't know how much fat and protein are in those bugs you scooped up. Bite off more human flesh than you can chew.